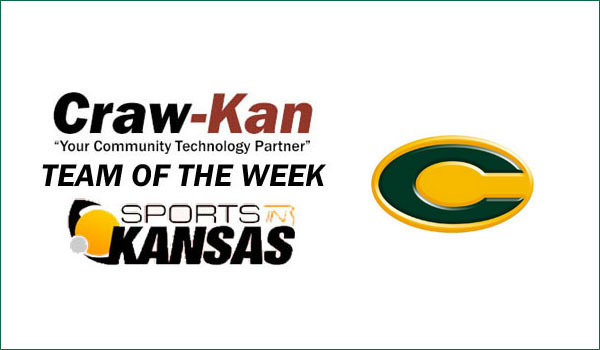 Chetopa has been named Craw-Kan Team of the Week for week four of the football season. The Chetopa Green Hornet football squad has been named this weeks "Craw-Kan Team of the Week" from the Southeast Kansas area for their 56-8 victory over Uniontown on Friday night in week four of the football season. "We were very focused, especially on defense. It was the best defensive effort we've had in my five years at Chetopa. We feel like we are a work in progress and know we have to get better each week." Chetopa head coach, Sean Price said. Chetopa had a balanced offensive attack with 140 passing yards (2 TD) from senior quarterback Phillip Moses and 107 total rushing yards, 76 (3 TD) which came from senior running back, Derrick Cassell. Junior receiver Sherrick Rogers had three total touchdowns (2 rec, 1 rush) as he caught five passes for 140 yards. But the real story was the Chetopa defense as coach Price mentioned, limiting a Uniontown team who averaged 48 points per contest to just eight points on Friday. Chetopa moved to 4-0 on the season and is the number one ranked team in 8-Man Division II. Many expect the Green Hornets to make a deep run in the state playoffs and Coach Price knows his squad has to be consitent all season long. "We have to be consistent on both sides of the ball. Cut down on mental breakdowns and play a great 4 quarters in order to be successful throughout the rest of the season." Price said. Chetopa will play Altoona-Midway this Friday. The Green Hornets are 2-9 all-time in the Kansas playoffs and lost to South Barber in the first round last season. The Hornets have never played for a state title in the playoff era of football and will look to change that this season. This new partnership with Craw-Kan and Sports in Kansas will highlight a Southeast Kansas Area team weekly and their achievements. For complete info: see below.